Happy belated Easter everyone! I hope you’ve all had a wonderful time wherever and with whomever that may be. I spent Easter with my family at Papamoa beach, one of my most favourite places. Here I always find myself happily content trotting back and forth to the beach, to walk, to swim in the calm seas, play in the wild seas, breathe, find balance and just be. Medicine for my soul. Fredrik and I had a couple of days to ourselves at the start of the holiday weekend and this combined with getting away from our little flat in Auckland, brought a welcome and unexpected burst of creativity. We've had a few things going on in our lives recently and perhaps because of that, I've repeatedly been feeling that my food and photographs are a bit boring. But anyway, I found myself shooting this green feijoa bowl and a watercress, cucumber and avocado combination, with a very happy result. For those of you outside of New Zealand that haven't heard of a feijoa before, I guess I should apologise! You've probably figured out that they are the small green fruit you see in the photographs. I don't think I've ever seen a feijoa outside of New Zealand, apart from once in the exotic fruit section at a supermarket in Stockholm - for an exorbitant price of course! I'm glad I didn't give in to my homesickness and buy one! To provide some context however, I've found out that feijoas are also known as 'pineapple guava' given that the taste is similar to a combination of these two fruits. While I'm not too familiar with guava, I can definitely agree with the pineapple undertones while the gritty texture closer to the skin, reminds me of a pear. For those of you from New Zealand, you’ll probably have many memories slurping the sweet flesh, or scooping it with a spoon. When we have extra time, for example on the weekends, or even as a weekday lunch, I'll enjoy my smoothies in a bowl as I've done with this recipe. I'll top with a favourite granola for a fulfilling contrast in texture, and increased fullness. Here I have topped with Little Bird Organics fig and ginger raw grawnola (buckwheat based), which is utterly delicious. Our small dwelling in Auckland is surrounded by neighbours that have an abundance of beautiful fruit trees. 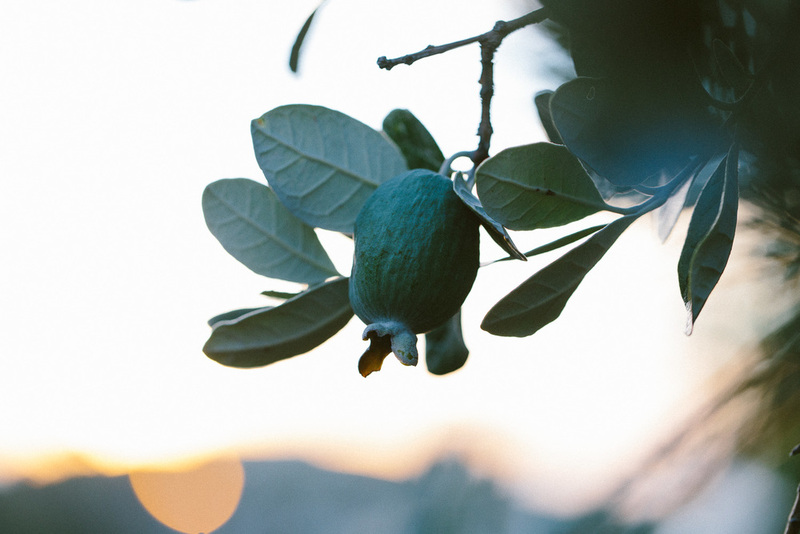 This post has therefore been complemented with some of my adventures up the road (post Easter), capturing beautiful shots of feijoas in the early morning light. I hope you like it! Blend all ingredients in a high speed blender. Add some filtered water if needed. Pour in a bowl and top with your favourite crunchy granola and fruit. ** For a simpler feijoa bowl, you can omit the pineapple and increase to one whole frozen banana. I am a bit obsessed with grapefruit so you can choose whether you want to omit this part also. Have fun with different combinations!